Courtly Choice (4) and David Miller get up in the final strides to defeat Dorsoduro Hanover (1) in 1:49 4/5 to win the 73rd Little Brown Jug Thursday at the Delaware County Fair. Courtly Choice and David Miller rebounded from a potentially damaging break in the first heat and got up in the shadow of the wire in the second to win the $642,000 Little Brown Jug, presented by the Ohio Harness Horseman’s Association, Thursday evening at the Delaware County Fair. When the field of seven was sent on their way for the $436,560 final heat, the first-elimination winner Lather Up (Montrell Teague) left from post two and outsprinted the second-elimination winner Dorsoduro Hanover into the first turn and controlled the fractions of :27, :54 4/5 and 1:21 2/5. Coming down the lane for the final time, Lather Up looked like the champ, but weakened in the lane allowing Courtly Choice to win by a neck in a four horse photo finish in 1:49 4/5. In the final print, Dorsoduro Hanover rallied for second. Lather Up finished third and Hayden Hanover fourth. The three-year-old son of Art Major is trained by Blake MacIntosh and owned by Hutt Racing Stable, Mac & Heim Stables, Daniel Piouffe and Touch Stone Farms. With his fifth Jug victory, David Miller joins William Haughton and Mike Lachance with the most driver titles. The second elimination was action packed from the start. Courtly Choice made a costly break in stride and was last in the field of six. Andy Miller sent Hayden Hanover to the early lead past the quarter in :26 2/5 and the “triple crown” contender, Stay Hungry (Doug McNair), took command before the half mile in :55. Miller sent Courtly Choice three wide down the backstretch and was in contention at the three-quarters in 1:22 4/5. As the field turned for home, Stay Hungry stayed strong and crossed the line ¾ of a length ahead of the late charging Dorsoduro Hanover (Matt Kakaley) and Courtly Choice. 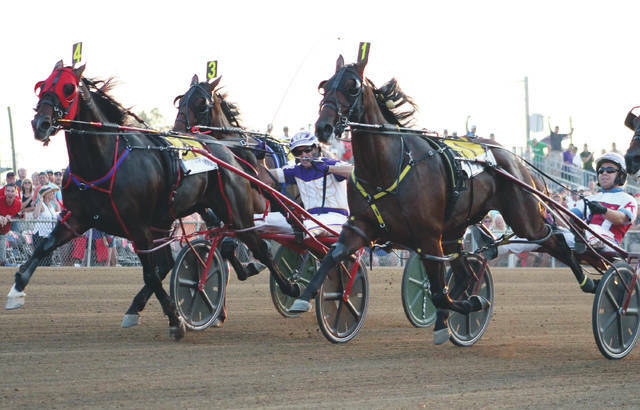 Before the connections made it to the winner’s circle, the ‘inquiry’ sign was posted for possible interference between Stay Hungry and Dorsoduro Hanover in the first turn. After a lengthy review, Dorsoduro Hanover (timed in 1:51) was placed the winner and Stay Hungry was disqualified and placed fourth. Courtly Choice and Hayden Hanover also qualified for the final. Stay Hungry was later scratched from the second heat. In the first $102,720 elimination, Lather Up protected his rail position and led the field of seven into the first turn and past the opening quarter in :27. Done Well was the first to challenge when Tim Tetrick came to the outside before the half in :55 3/5. This Is The Plan, who sat second for the entire mile, put forward a late effort, but Lather Up used a :26 4/5 last quarter to cross the line in 1:49 3/5. This Is The Plan was second, 1 ½ lengths back. Babes Dig Me (Brett Miller) and Done Well finished third and fourth to advance to the final. Originally, Courtly Choice was ineligible for the 73rd LBJ, but his connections elected to pay the $45,000 supplemental entry fee after winning the $701,830 Meadowlands Pace Final on July 14. With the winner’s share, Courtly Choice now sports $952,704 on his career earnings card. I’m Your Captain (Andy Miller) used a four wide move around the final turn to defeat Hill Street (Yannick Gingras) and Maxus (Jimmy Takter) to take the Old Oaken Bucket in 1:55 2/5. The pacesetting Treasure Tee (Trevor Henry) faded to fourth. I’m You Captain is owned by Andy Miller Stable and Black Horse Racing and trained by Julie Miller. The Muscle Hill colt has won four out his last seven starts. David Miller and Broadway Donna used a perfect second over trip and defeated NF Happenstance (Jack Parker, Jr.) by 1 1/4 lengths in 1:53 1/5. Ice Attraction (Yannick Gingras) was third, another two lengths behind. Broadway Donna is trained by Jim Campbell and has amassed $1.4 million for Fashion Farms. Workin Ona Mystery (Tim Tetrick) defeated stablemate Air Force Hanover (David Miller) in 1:50 3/5 to take the freshman colt pace. The field raced in post-position order through the first three quarters of the mile in :27, :54 3/5 and 1:22 2/5. Tetrick tipped the eventual winner off the rail and cruised home in :28 1/5 to establish a new lifetime mark and remains undefeated in three career starts. The Captaintreacherous colt is conditioned by Brian Brown for Jim Stambaugh, Alan Keith, Milton Leeman and the Wingfield Brothers. Prospect Hill (Andy Miller) took the lead as the field approached the half mile station and never looked back to win the $48,218 Standardbred by 2 ½ lengths over Final Claim (Mike Wilder) in 1:55 1/5. The son of Muscle Hill has won seven of nine seasonal starts for Stroy Inc. and trainer Julie Miller. Rockathon (David Miller) took the opening division in 1:52 over Slick Mick (Tim Tetrick) and Born To Be Bad (Andy Miller). Trainer Kimberly Dailey and Carl & Melanie Atley own the gelded son of Pet Rock who has pushed his career earnings to $338,615. The second $55,777 division went to the heavily favored Bounding Dragon and Dan Noble in 1:51. The winner went gate to wire for owners Alan Keith and Melanie Atley and trainer Mike Roth. The ultra-consistent Bounding Dragon has finished in the top two places eleven times this season. Rock Candy (Ronnie Wrenn, Jr.) went gate to wire to win the opening division in a stakes record 1:51 3/5. The Pet Rock gelding is owned by Country Club Acres, Joe Sbrocco and Richard Lombardo. Trainer Brian Brown returned to the winner’s circle in the second $66,953 division with Dislocator (Chris Page). Joelyn Ridder, Scott Davis, Sharron Sopronyi and VIP Internet Stable own the Big Bad John colt who defeated Seattle Hanover (Matt Kakaley) and Authentic Hanover (Tyler Smith) in 1:54 4/5. Baron Remy (Chris Page) and McVenus (Trace Tetrick) took the two $55,852 divisions in 1:53 and 1:52 2/5, respectively.